On this Thanksgiving week, we would like to extend our deepest thanks to all of you who have made our dream possible. As you probably know, we are a small husband and wife company: we decided to move (back) to France after 18 years in the US, to raise our daughter next to our family. 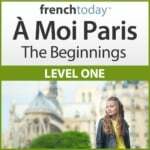 We created French Today to help English speakers master the modern French language, French like it is spoken today. We are very happy with our “new” life, and remember every day that this is all possible thanks to you. Alors, merci, merci mille fois, mille mercis à vous tous ! If you like what we do, in particular the daily Facebook mini-lessons, Twitter, the French tips in our weekly newsletter or our weekly blog, here is how you can help us. You can leave a quick review easily on our audiobooks on this page. This is really important to us since your comment can help other people trust us, and buy our audiobooks. Word of mouth is the best advertising there is. Think about those around you who could be interested by French Today: your colleagues, fellow students, teachers, any friend or family member is studying/has studied French? Someone who travels to France? Or someone who enjoys French wine or food? At the top of all the pages of this site, you’ll see buttons: Facebook Like, Tweet and Pinterest. If you use these social networks, clicking these buttons would help us tremendously: they get the word out and they help French Today rank higher in searches. You know France inside out, or love French cooking: if you feel you have expertise in something France-related, and you are dependable and serious about contributing to our blog, we’d love to hear about it. Contact us. Each and every one of these steps would help our business grow. Thank you to all our patrons who made moving from a large US city, quitting well-paid jobs and returning to France possible. We love our life close to our family in a small town, and we hope French Today keeps growing so we can raise our daughter close to our loved ones. Click here to see all our downloadable French audiobooks.